I made a trip to the farmers' market last Saturday morning. During the summer months, this is a weekly occurrence, worthy of a mention along the lines of "I got out of bed this morning." During the winter though, this has not been the case. Up until this year it wasn't possible for me to go—there was no market to go to. But this winter, the market I started going to early last summer (The Brookside Farmers' Market) started hosting a bi-monthly, indoor, winter market. I went to the first one...and I loved it. I had every intention of faithfully going for the duration of the winter. But since it wasn't part of my routine... it just didn't happen. I have no excuse. But this past Saturday, I returned. And I was so glad I did. 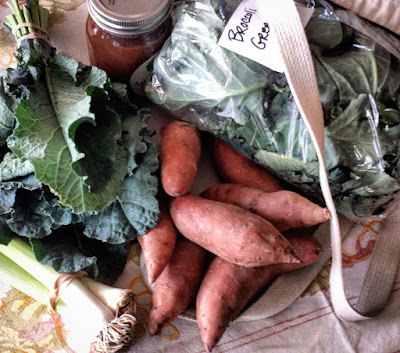 I came home with leeks, beautiful little sweet potatoes, broccoli greens (a new one for me), and Tuscan kale. I used the sweet potatoes first...they were perfect for roasting (their size and shape made beautiful little medallions). I am using the leeks today—in a simple potato leek soup (perfect for our late winter snow day). The broccoli greens ended up in a garlicky braise with a handful of chickpeas. Since I was unfamiliar with this green, I had asked the grower about it (always a good idea). He told me they were most similar to Collard greens...although the tiny leaves were tender enough to throw in a salad. My bag of greens was a mix of large and small, so a simple braise seemed like the thing to do (again...it's always a good idea to at least use a process that is familiar to you if the ingredient is not). I thought they were delicious...and very nice served over a mound of bulgur and topped with a fried egg. I decided to use the kale raw, in a salad. This is unusual for me. I know that kale salad is beyond hipster at this point...almost to the point of being passé (so I am definitely late to the party). It just so happens that I really like cooked kale. I have of course eaten...and made...kale salad. It's just not the first thing that leaps to mind when I have kale on hand. But when I got this kale home and looked at it, I knew it really belonged in a salad. It was just so tender and beautiful. I don't know why, but I started thinking recently about a salad that I used to make for myself in college. I think it's fair to say that it's no secret that I spent the early years of my life actively avoiding vegetables. By the time I got to college I must have been aware that there was benefit in vegetables...and salad...so I occasionally made myself a salad at the salad bar. Although, I managed to avoid all the raw vegetables that were on offer: my salad of choice was a small amount of lettuce (probably ice berg...it's really hard to say...this was long before the day of the now ubiquitous "mixed baby lettuces"), creamy blue cheese dressing, salty roasted sunflower seeds and dark raisins. Even back then, this salad hit all my favored flavor and textural buttons: salty...sweet...crunchy...chewy...creamy... with the nice pungency of blue cheese thrown in for accent. The lettuce was just the delivery system. 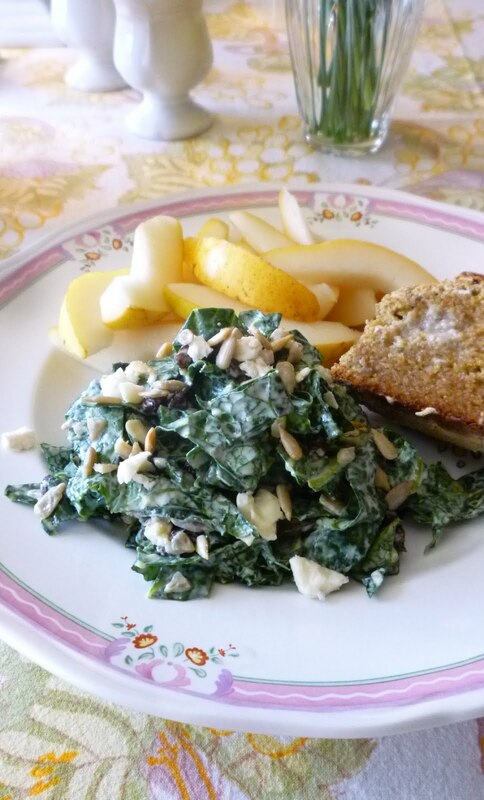 I'm not sure why I never recreated this salad before now, but it occurred to me as I thought about kale salad that kale would be an admirable green with which to make it. The substance and texture of kale are sufficient to stand up to the actual physical weight of the seeds, raisins and heavy dressing. Moreover, I thought the mineral-y tasting—slightly pungent...slightly bitter—raw kale would be enhanced by these salty, sweet and pungent additions. And it was. In the unlikely event that you are new to kale salad, one of the great things about it is that it can be dressed ahead. In fact, it really should be dressed at least an hour or so before you plan on eating it. If you dress it and eat it right away, it is just way too chewy. Eating it becomes a lot of work...and as you chew you really do have the feeling that you are eating it "because it's good for you". I admit that I have very little patience for that kind of eating. Food should be enjoyable and delicious! Dressing the kale ahead will make it so that it is as enjoyable to eat as it is delicious. Frankly, kale is substantial enough that you can dress the salad a day ahead and it will be even softer....but still not soggy. Depending on your textural preferences, you might even like it better on the second day. If you have a winter market in your area, I encourage you to make a point to give it a visit. Doing so will give you a sense of what grows...and even thrives...in your area during the inhospitable months of winter. It's also a great opportunity to support the people who work so hard to bring you beautiful local produce during the spring, summer and fall. And in the winter, you will probably get to sample some of the things they make with what they grow...baked goods, jams (I picked up some local apple butter last week), pickles/fermented foods, etc....in addition to all the squash and root vegetables that have been kept in appropriate winter storage. And if there is not a winter market in your area, you should definitely make a trip to the store to pick up some Tuscan kale (and any of the other ingredients that you might need) so you can make this salad. You might even be able to get someone who doesn't like vegetables to give it a try. 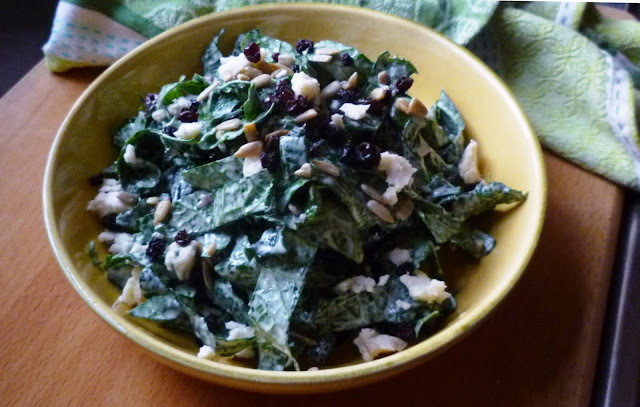 When I was in college, I made this salad with dark raisins. 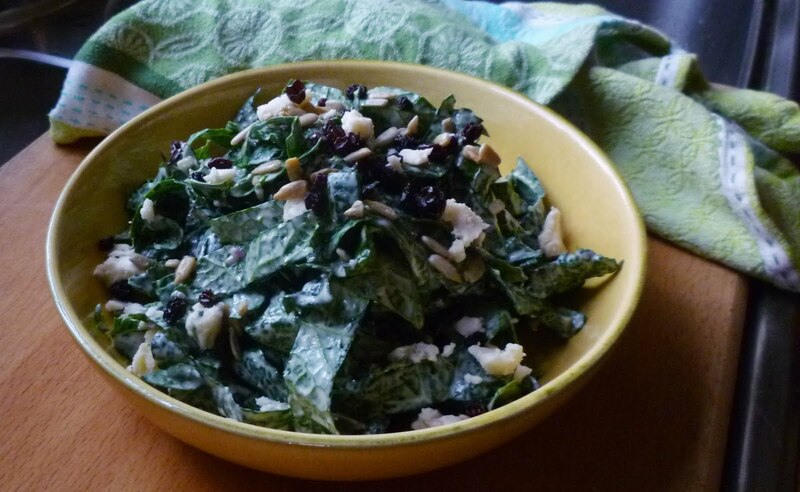 In its reincarnated form with kale, I make it with currants—which seem a bit more refined—instead. But if you have raisins on hand, you can obviously use them. 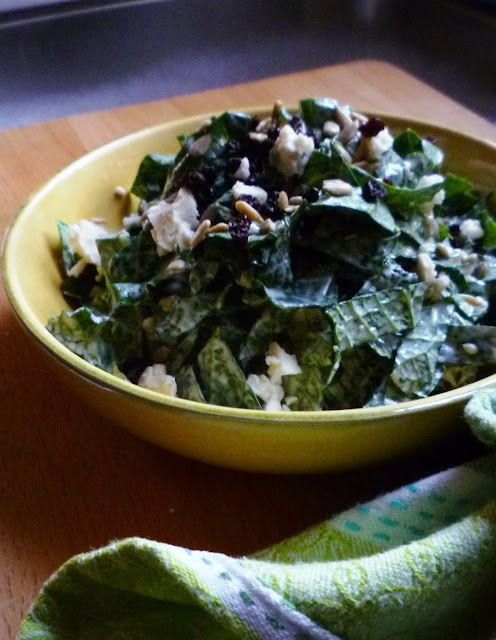 At least an hour before you plan to serve the salad, place the kale in a large bowl. 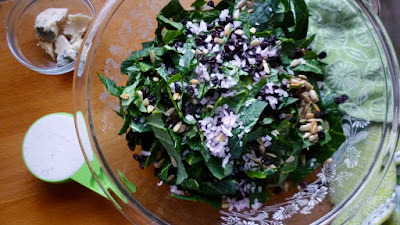 Season with salt and pepper and scatter a quarter cup each of the sunflower seeds and currants over the kale along with the shallot. Drizzle a third cup of the dressing over the contents of the bowl, and using your hands, toss the salad, massaging the leaves a bit as you do to make sure they are well coated with the dressing. Add more dressing if you like. Taste and correct the seasoning. Cover with plastic and chill for at least an hour. To serve, re-toss, adding more dressing if necessary. Mound the salad on individual plates or in a serving bowl and top with a scattering of the remaining sunflower seeds and currants. Garnish with Roquefort crumbles and serve. Serves 4 to 5. You can of course use a purchased blue cheese dressing for this salad...but I really don't recommend it. 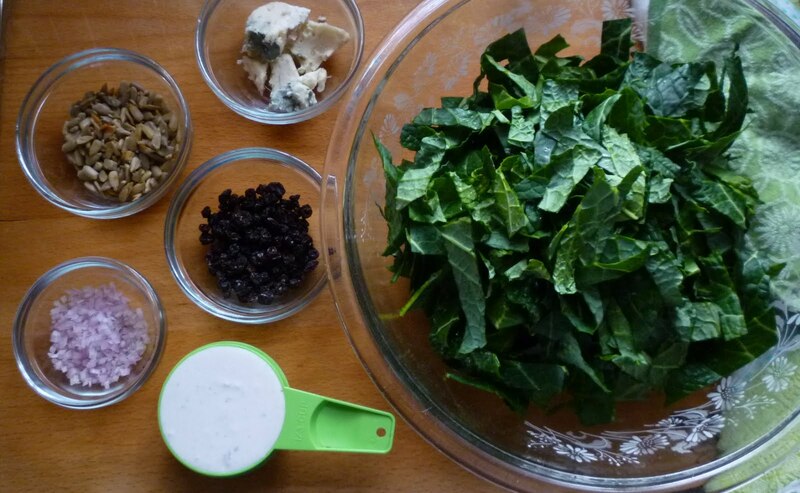 Homemade blue cheese dressing is simple to make and oh so delicious—particularly if you make it with a good Roquefort cheese. Place the red wine vinegar in a small bowl. Whisk in the garlic. Whisk in the mayonnaise and sour cream until smooth. Add the cheese, placing it at the side of the bowl, and begin to mash it with the back of a spoon or a fork, gradually incorporating the mayonnaise-sour cream mixture into it. Continue to mix until the dressing is homogenous. Your goal is to incorporate the blue cheese in such a way that the dressing is smooth and creamy. If you make a larger batch, you could do this more efficiently in the food processor, but this small batch wouldn't work very well in a large food processor. Season to taste with salt & pepper. Makes a generous 2/3 cup dressing. Note: This is the identical to a recipe I posted a few years ago except that it has more vinegar. I found that my normal blue cheese dressing wasn't quite sharp enough for the kale.